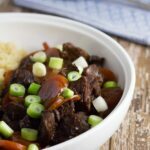 In my mission to bring you more slow cooker recipes, here is my latest – Mongolian Beef, which is one of my favourite ever Chinese dishes, the other being Cashew Chicken. I used to eat take out quite regularly several years ago and Chinese take out was one of my top three, alongside pizza and Thai food. These days, buying take out is mostly a thing of the past as my love of cooking and my knowledge of nutrition has increased immensely. I also dislike not knowing what is being added to my food and when you have a household of people with food allergies and sensitivities, you really have to be careful with your food choices. This Mongolian Beef recipe is amazing and is pretty close to the traditional version. I have actually have amended the ingredients and this recipe is version two. I felt that the sauce in my original version was a bit too sweet. I also cooked this version a few hours longer than my original version and really think this is going to be a hit for you. Cut the steak into small bite sized pieces. Season beef with arrowroot, salt and pepper. Heat coconut oil in large fry pan on medium high heat and cook steak until evenly browned, approximately 3-5 minutes (You may need to add the steak in batches and use extra coconut oil between batches). Add to slow cooker and cover with garlic, ginger and carrots (and any other vegetables that you want to use). Add coconut aminos and honey and mix through.